As with any product, the question of durability totally depends on the brand. Even if you find a brand that a lot of people have trouble with and, for whatever reason, you’re really sold on that brand in every other aspect, if they have a good warranty you might as well try it out. Although, there are others who are a little more cautious buying products that aren’t known to be reliable and/or durable. So, the question is, how long can you expect these things to last? That’s really a tough question to answer because in order to answer accurately one would literally have to test hundreds and hundreds of the same model in order to get a really accurate idea of how reliable it is. The good news is that we can make a determination based on reviews found on the Internet. Generally, you can’t go wrong with the top brands and/or models. Included among those are NJOY’s products, BluCigs, the m402 from LiteCig or another retailer, the Joye 510 model from a reputable retailer and a few others. Keep in mind, however, that only the first two I listed there have a decent warranty, so if you’re the cautious type you may just want to stick with those or another brand that offers a full 1-year warranty. That said, no matter what you do you’re going to have components crap out on you occasionally, there’s really nothing you can do about that. So I’ll give you a little info on how long to expect the components to last in electronic cigarettes so you have an idea what to expect. Through my own experience and what I’ve heard from others it seems that you’ll probably need to replace an atomizer every 3 to 4 months of regular use, so it’s never a bad idea to buy an extra one to keep around as a spare. Atomizers run somewhere in the range of $5-$10 or more depending on the model. 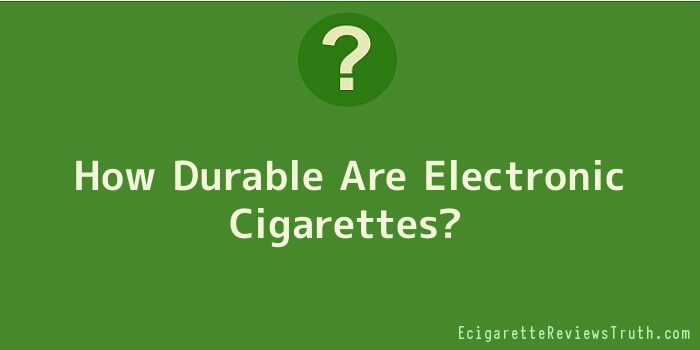 Most of the batteries used in electronic cigarettes are of the lithium-ion type and so should last several years; however, since these products are so new, being introduced to the United States only a couple years ago, it’s hard to say what the long-term prospect for batteries is. Just like with atomizers though, you should assume your primary battery will crap out at some point in time and so it’s a good idea to keep a spare around. Most starter kits should come with at least two batteries, if not more, so you should be all right for while. However, if one of those batteries dies on you it would behove you to get a new one to keep around as a spare just in case. New batteries can be had for anywhere from $10 on up to $30 for some of the more expensive brands; the average is probably around $10-$15 for a battery. Cartridges contain the nicotine solution and those will wear out eventually as well. I’m not talking about the nicotine solution itself, of course that will run out and have to be replaced on a regular basis as you use the device, but the cartridge case itself will get damaged over time from biting it, or dropping it and so on. If you use a device that offers prefilled cartridges you don’t have to worry about the state of the cartridge casing since you’ll get a new one with each cartridge. However, if you plan to refill your own cartridges with eLiquid, you won’t be receiving regular replacement cartridge casings and so eventually you’ll need to purchase some. They’re not expensive at all perhaps five for a few dollars or somewhere in that range. For the most part, that should be all you’ll have to worry about for a while as far as durability goes. Of course, as with any electronic device you run the risk of the battery charger dying or your USB pass-through, if you have one of those, dying on you as well. I’m sure these things crap out eventually, so just in case, make sure the company you buy your starter kit from offers replacements for every component and you should be good to go.